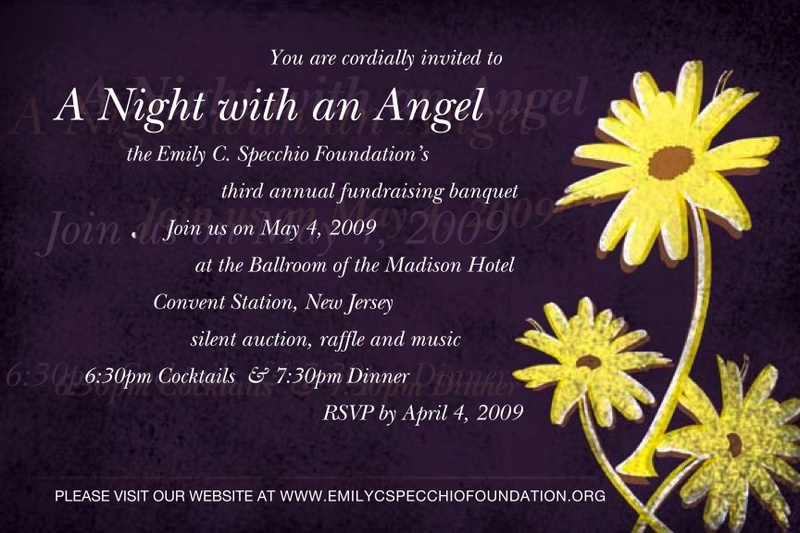 The Emily C. Specchio Foundation » 3rd Annual “A Night with an Angel”! 3rd Annual “A Night with an Angel”! Be a part in keeping Emily’s dreams alive. You won’t want to miss out on this fun and inspirational night. Please RSVP by one of the 2 methods listed below by April 27th, 2009! 1) Donate items for our silent auction! If you have items to donate, please contact us through the contact page. 2) Join us for our 3rd annual “Night with an Angel” benefit dinner! Stay tuned for more updates, but the night will include an open bar, full dinner, live music, silent auction, presentations on the work and progress of the foundation, awarding of the annual Emily C. Specchio Scholarship, and an inspiring keynote speaker! Visit our “Night with an Angel” section to learn more and see pictures of past events! RSVP online through the “contact us” page and in the message body, please leave your: name, address, email, telephone, number of seats, and names attending. Also feel free to make requests for table assignments. Payment for the dinner can be made online through Paypal. 3) If you cannot attend the event, but would like to support the Emily C. Specchio Foundation, please either send a check made out to “The Emily C. Specchio Foundation” and mail it to The Emily C. Specchio Foundation c/o David A. Lewis, Esq., 52 Maple Avenue, Morristown, NJ 07960 OR Donate through paypal via this website. All Donations are tax deductible! Thank you for your generosity and we hope to see you all on May 4th! !